Embarrassing: Because Mrs May is fond reminding us that she is a Christian. Mr Cameron reminded us that we were a Christian country. The Queen apparently lives her entire life according to the teachings of Christ. Maybe a bit of bible study would be in order. Embarrassing: Because, “Take my hand”, she sings, “I’m a stranger in Paradise.” Kismet? Embarrassing: Because….eugh, no comment! 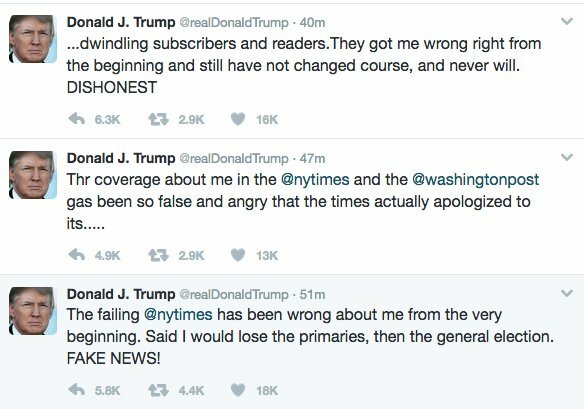 I feel sick.
.@realDonaldTrump Fact check: @nytimes subscribers & audience at all-time highs. Supporting independent journalism matters. Embarrassing: Guys, this is the 21st century! You’re old men, not children. Stop playing at fancy dress parties and get a bloody job. Embarrassing: Didn’t their very first manifesto make it a matter of priority to get rid of the House of Lords? Embarrassing: Just how heartless and thoughtless and downright bloody wicked was it to harass this lad? Embarrassing: Theresa May has just signed a £100 million deal to provide President Erdoğan’s government with fighter jets. President Erdoğan has an appalling record on human rights and is seeking ever more powers. It seems only a short time ago when Westminster was warning against Turkey being allowed anywhere near the EU. They are becoming as inconsistent as Trump. Embarrassing: Because this moron once tweeted something to the effect that his parents hadn’t come to ‘this great country’ so that their way of life could be ruined by immigrants. Dufus or what? But amusingly, I see that part of the 2,000-mile wall that he’s going to build runs through territory “given” to native Americans. The Tohono O’odham Nation have a border with Mexico which they cross regularly to meet with friends and family who live in Mexico. They have stated quite clearly that they will not allow the wall to be built on their territory. A war with a native American tribe would be all sorts of embarrassing for Dumbo. But a wall with a 75 mile gap in it would be completely useless. A little research before he made his vow might have saved him.